I've just read an article about garden paths in the latest gardening magazine. There are photographs of gravel paths, crushed shell paths, paths created with stone pavers, log rounds, stone pavers and small round river stones, log pavers with small round river stones... Each path is purposeful, sensible, and obvious....take me! take me! I'm a path! The article is very helpful. Paths are for walking on. I know that. I try to walk on all my paths at least once a week. Paths must lead somewhere. I know that too. I've watched the routes my dog takes as he snuffles his way through new garden developments, and often have taken his advice. I know the parts of the garden that we both need to get to. It's true that none of my paths have hard surfaces. But I am a fanatic edger of paths, and many trailer loads of large river stones have made the journey here to their final resting place. I've traded off good edges for the surface between. 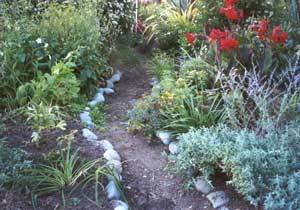 Plantings near the edge can soften the lines that a path takes. I know that this piece of well meaning advice has been my downfall. My problem is that my paths disappear. They become impassable - they get lost. I like to call them The Fabled Lost Paths of Mooseygan. The first wee path I proudly built weaved its way through the JAM garden from the glass-house to the Wattle Woods seat. What nicer journey could there be? 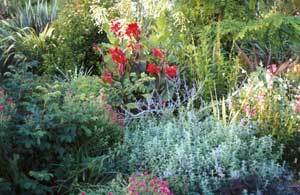 When I needed a break from pricking out or potting up I could duck out, step between the Smoke Bush and the Miscanthus Zebrinus, past the upright red striped flax, under the natural archway of the Rugosa roses, slalom past the Rhododendron and sit down. My second wee path was a true dog-path, designed by my dog Tajdog. It was in a new garden over the water race, and lead around the big Wattle tree, down to the water's edge for a quick drink, then along the line of hebes and up past the huge flax to the lawn to sneak up on snoozing ducks. Paths three and four moved sensibly through the large new borders, so that people with wheelbarrows as well as dogs could reach the duck lawn. 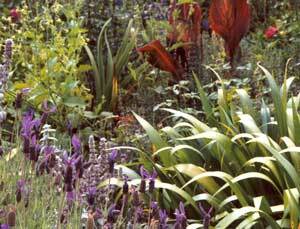 By now I was keen to keep larger plants back from the path, for obvious reasons, and cleverly chose low edge plantings of Iris Japonica and Stachys. Not-so-cleverly I got a little carried away with catmint, lavender and sedums, putting them in the second row. Brave path-goers can sometimes make it through the gauntlet of bees. In a moment of total madness I planted a rather bulky and very spikey plant as an accent at the end of one path. I was copying a planting I'd seen, and thought it a very stylish move. Another of my paths ends with the rose from hell (why didn't I read the label?). Opposite the rose are some plants which I think are asters, which of course have grown as tall as my lovely sons, and flopped - guess where? They are the most beautiful and vibrant deep pink and purple, and until they stop flowering they have to stay put. I haven't even mentioned the stand of self sown Nicotiana Sylvestris, so majestic, and beautifully fragrant in the early evening as intrepid path followers push carefully past. I never seem to learn - I always plant things too close to the edges. Even the newest path is impassable. This 'wild and winding path' is covered with branch and trunk debris from storm damaged gum trees, reducing it to an ankle tripping obstacle course. It's impractical to clear up the mess in the middle of a total fire ban (that's my excuse, anyway). My partner is typically rude, saying that my paths "all disappear into overgrowth". When I suggest some structures like archways and posts to keep the plants clear he instantly disappears to "check on the sheep". I'm making plans to re-open the JAM garden path. This will involve considerable re-routing, since the Smoke bush and the Miscanthus are both getting bigger. The natural archway of the Rugosas will be enhanced by a partner-made construction. For the other paths, plants will move. The spikey plant which needs a radius of two meters will be banished to a new internal position, and roses and flopping perennials will be moved this Autumn. I already have enough shiftees to create a new garden. Hmmm... I wonder if it needs a path through it?